Jazz insiders know that skipping even a single performance by the talented and adventurous 17-piece Diane Moser’s Composers Big Band (DMCBB) means missing a once-in-a-lifetime musical experience. 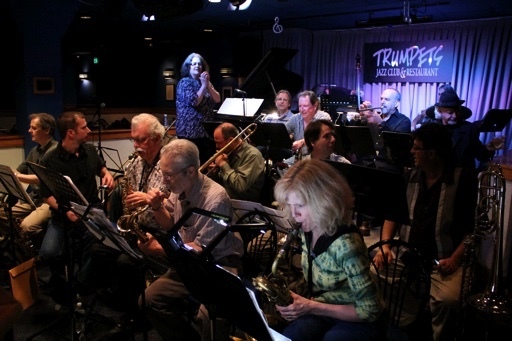 Formed by composer/pianist Diane Moser and a dedicated group of musicians and composers with the intention of exploring the possibilities of big band music and moving it forward, the band has lived up to its mission since its debut gig in January 1997. The DMCBB is equally at home playing the classics and pushing boundaries. Any given set might contain tunes that would be a good fit for big band greats throughout jazz history, along with straight-ahead jazz, Latin, funk, blues, Indian raga, and experimental efforts. They have visited hip-hop territory, performed a jazz opera, and paid tribute to legendary composers such as Charles Mingus, Jaki Byard, and Oliver Nelson. Special guests like singers, poets, spoken word artists, actors, filmmakers, and sound painters have lent their talents to the fearless ensemble, which has also hosted talks by educators and others delivering tributes and oral histories. The DMCBB has even ventured into the cosmos with “Science Meets Music” and “The Music of the Spheres” gigs featuring Moser originals and George Russell’s “Jazz in the Space Age,” making them the only band besides Russell’s to ever play the suite. In the past two decades, the DMCBB has hosted more than 100 guest composers, from internationally acclaimed jazz icons such as Jane Ira Bloom, Mark Dresser, Howard Johnson, Oliver Lake, and Michele Rosewoman to student writers hearing their compositions performed by a large ensemble for the first time. The band also regularly focuses on presenting original works by more than a dozen resident composers, who will be in the spotlight at the March 22 celebration. The 2017 resident composers roster includes Dennis Argul, Barbara Cifelli, Jim Cifelli, Marty Fogel, Matt Haviland, Rob Henke, Rob Middleton, Diane Moser, Chris Rogers, Erick Storckman, Russ Vines, Ed Xiques, and Craig Yaremko. Regardless of the occasion or the repertoire, the style, or the complexity of the music, listeners can count on each Diane Moser’s Composer’s Big Band concert being heartfelt, dedicated, adventurous and flat-out fun: Listeners are gonna be entertained and inspired. The DMCBB will delve into its enormous and enviable repertoire March 22, with the focus on works by resident composers. There are bound to be some surprises, including new music, and surprise guests onstage and in the audience.